When managing a large number of reports, the process of hiding and un-hiding rows and columns can become laborious. So writing some code to do this automatically is the obvious step. The first step is to create a row and a column within each report that denotes what to hide and what to show. In row 1, fill each cell with TRUE (show this cell’s column) or FALSE (hide this cell’s column). Do this until you have covered all the columns in use on this worksheet. 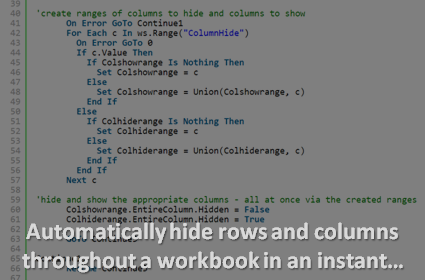 Now assign a worksheet-specific name to this range of booleans – ‘ColumnHide’. Repeat the same process in column A to deal with all the used rows in the worksheet – give this the worksheet-specific name ‘RowHide’. As you may have spotted, by originally using cell values of TRUE or FALSE, we can also formulaically determine whether a row/column is shown/hidden. Perhaps some rows are only appropriate when viewing certain months, for instance. In this situation we would use a worksheet-change macro to call row & column hiding whenever a new month is selected.